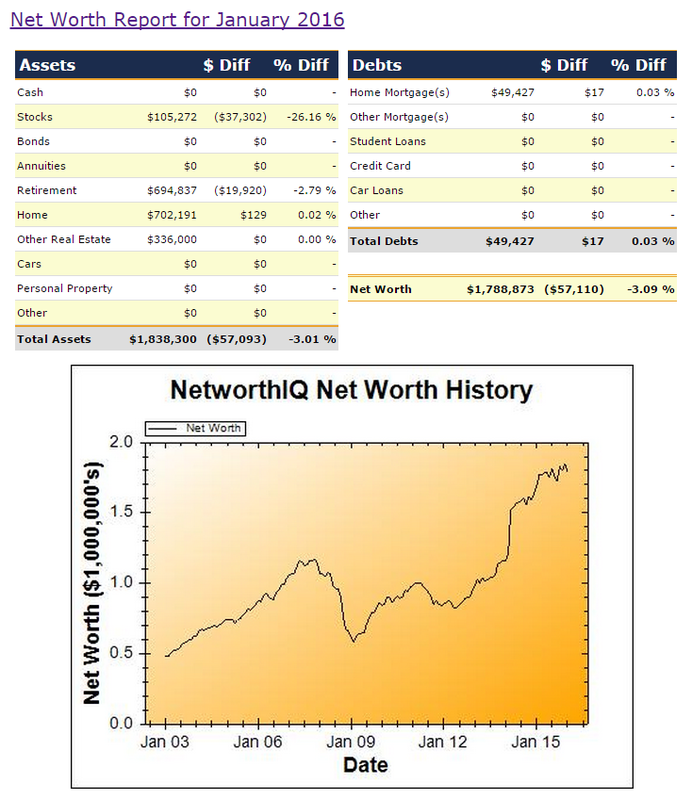 As would be expected for a high risk investment approach, my net worth dropped considerably last month, due to the global uncertainty regarding China growth, and the negative sentiment seen in stock markets around the world. My geared share portfolio was down a massive $37,302 (-26.16%), and my retirement savings (SMSF account balance) was down $19,920 (-2.79%) as it is largely invested in local and global stock markets via the Vanguard High Growth Index Fund. On a more positive note, the estimated value for our home was fairly stable, with the 'correction' in Sydney house prices being more of a sideways move than an actual drop in average sales prices (so far). Overall, my net worth decreased by -$57,110 to $1,788,873 (-3.09%). So far it isn't looking likely that I'll become a 'multi-millionaire' in 2016.